Joel Osteen is a false prophet, teaching that Mormons are Christians. 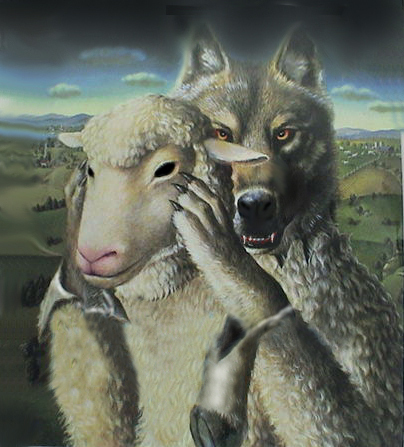 The Bible exposes Mr. Osteen as a wolf in sheep's clothing. I do not condemn anyone for their sins, for we are all sinners deserving of Hell; however, as Christians we are commanded to contend for the Christian faith. Joel Osteen's church in Houston, Texas, boasts of 70,000 visitors per week. Millions of people worldwide are being influenced by Joel Osteen. For Mr. Osteen to claim that Mormonism is a Christian religion is a blatant denial of the Christian faith. Mormonism is a false religion which denies the deity of Jesus Christ, teaches Works Salvation and Baptismal Regeneration, teaches that Jesus came from a planet named Kolob, and teaches that men can become gods. This is what New Age teaches. These are unbiblical teachings. Joel Osteen, Rick Warren, are other sinister ministers today are all pawns for the New World Order. Their goal is to unify the world's religions into a One World ambiguous religion, to condition the masses of this world to receive the coming Antichrist. In sharp contrast, the Bible proclaims that Jesus Christ is the ONLY way to Heaven. Mormonism has ANOTHER Jesus, and not the same Jesus taught in the Word of God. Mormonism has ANOTHER Gospel, and not the same Gospel taught in the Word of God. Joel Osteen is a Word Faith preacher, an alleged evangelical pastor, who recognizes Mormons as Christians. For more on the Mormon view of Jesus we refer you to Mormon Church: Deity of Christ. But as you can clearly see above, Joel Osteen has said Mitt Romney, as well as other Mormons, are “true Christians.” That is untrue! Mormons are children of the Devil and still hellbound in their sins. Joseph Smith was a 33rd degree occult Freemason and founded the Mormon religion in 1830, as part of the New World Order deception. Likewise, Charles Taze Russell founded the Jehovah's Witness religion in 1874 and was also a 33rd degree occult Freemason. See, Religions: The Occult Connection. In the Apprising Ministries article Joel Osteen: Apprising His Word Faith Teachings I have clearly showed those who are looking for the truth that Osteen teaches the exact same positive confession Word Faith theology and prosperity gospel as did his late father John, Kenneth “Dad” Hagin (1917-2003), and which is also currently being preached by Hagin’s dutiful disciple Kenneth Copeland and Oneness Pentecostal T.D. Jakes for that matter. Sadly another sign of the growing spiritual blindness and apostasy in the American Christian Church right now that someone like Joel Osteen is steadily gaining much acceptance even among mainstream evangelicalism. And this comes despite a theology completely consistent with other mainstays on the Trinity Broadcasting Network such as Benny Hinn, Rod Parsley and “pastor” Paula White. But the news gets even worse for Joel Osteen because running on a parallel track the Church of Jesus Christ of Latter-day Saints (the Mormon Church) is also beginning to make inroads toward being considered a legitimate form of Christianity. As case in point we offer Mormons and Evangelicals Ready to Worship Together? But what does this even have to do with Joel Osteen? Well, I’m so glad you asked. Osteen heads up arguably the largest evangelical church in the country. And there he was on Fox News Sunday a while back saying that in his mind Mormons are genuine Christians just as I originally pointed out in Joel Osteen: Mitt Romney And Mormons Are Christians. But the saddest news of all may be that now Joel Osteen has pronounced blessing on the non-Christian cult of the Mormon Church as being Christian; and to this day there has been no outrage, and no evangelical leaders publicly calling Osteen to account. No instead, it’s just business as usual in the apostatizing American Christian Church saying, Peace, peace; when there is no peace (Jeremiah 6:14, KJV). Kabbalah is of the Devil and so is Mormonism. Joel Osteen is a fake, a wolf in sheep's clothing, a false prophet and an enemy of the cross of Jesus Christ. 2nd Timothy 4:3, “For the time will come when they will not endure sound doctrine; but after their own lusts shall they heap to themselves teachers, having itching ears.” We are living in the Last Days, when people will NOT tolerate Biblically sound preaching. Joel Osteen preaches psychology and a wishy-washy type of motivational speaking that is anything but sound doctrine. America is dying for hell, fire and damnation preaching. The great need of our time is preaching preachers who SEARCH THE SCRIPTURES (John 5:39). The damnable Mormon religion began with Joseph Smith, period. Smith is burning in Hell this moment, which is exactly where his followers are going when they die. I say this kindly, for my only concern is the salvation of souls. The Bible plainly warns about those who come preaching “another Gospel.” Mormonism teaches a false Gospel. Just as with most false religions, Mormonism superficially promotes family closeness and helping the community; but when you shine the Light of God's Word upon their core beliefs, a bizarre system of sexual perversion, strange doctrines and occult worship are uncovered. One need only view their main temple in Salt Lake City, Utah, to find the All-Seeing Eye of Horus above the door on the temple. Joseph Smith, Salt Lake City, UT: (Latter-day Saints, LDS, Mormonism) Main body of Mormonism; recognizes Brigham Young as Smith’s successor. Smith claimed that the Father and Son appeared to him and called him to restore the true Church. LDS Church teaches that God the Father was once a man and was exalted to Godhood. God (and his heavenly Wife) begat billions of spirit children, the firstborn of whom was Jesus. Lucifer was the leader of God’s rebellious spirit children. Those spirits who did not rebel become human beings in order to begin process potentially leading to exaltation to Godhood. Jesus, however, became a God while only a spirit. He organized our world and is Jehovah, the God of Israel. He is a separate and subordinate God to Elohim, the Father. A distinction is made between the Holy Ghost, who is a personage of Spirit, and the Holy Spirit. The latter is a divine energy, force, or spiritual essence that fills the universe and is used by all three members of the Godhead in the exercise and accomplishment of their will. The Church rejects the orthodox doctrine of the Trinity. It also redefines salvation by grace to refer simply to resurrection. Almost all humans will be resurrected into one of three kingdoms of glory, the least of which is far superior to anything known in this life. Entry into the higher kingdoms, and one’s rank there, depends not only upon the atonement of Christ, but also upon one’s good works. Achievement of the highest potential within the highest kingdom—Godhood—requires complete “obedience to all the laws and ordinances of the gospel.” The Bible, Book of Mormon, Pearl of Great Price, and Doctrine and Covenants are all considered scripture. Publishes Church News and Ensign magazine. Profile available. Research material available.